Description: 41T rolls west down the Chemung valley near Wellsburg with 31 cars on a cold December day. Description: 41T rolls its 31 cars through Waverly in golden light. This was normally a mid day train, and is running a little late today, which is working to my advantage, as is the clean CN unit leading, making this shot at the model railroad buildings here look prettier than they really are. Description: The last semaphore in service on the Southern Tier witnesses the passing of 41T at west Endicott. Description: Theres a place just west of Owego known as Goodrich Settlement, which has a road crossing the tracks that runs out to NY 17C. Im uphill from the crossing where the view is panoramic as 41T rolls west. Description: 41T rolls past CP Johnson on the Johnson Running Track-the connection from the ex DLW to the ex Erie, as it begins its trek to Buffalo and Toronto with 31 cars this day. Description: I went past this spot often, but rarely shot photos here. I loved the way the sun would light up the corn once it had turned brown after the growing season, and thought it would make a great low light photo. The problem was, the light was wrong most of the day, and the corn was this color for a short period. It was a very limited window of opportunity. I got lucky this December afternoon, getting a nicely lit shot of 41T passing MP 244, a mile west of where the twin semaphores once stood. Description: Partly because its easy to get to, partly because the backdrop of the buildings is like something youd find on a model layout. The only thing missing is a station, which was over my left shoulder, and wiped out by a derailment here in 1967. Description: 41T rolls down the Chemung valley seen from NY 427 just east of Wellsburg. If you shot him at Chemung, you really had to hustle to beat a train here. Description: The WC had a lot of cars out of Northtown today, and he was just barley doing 3mph when I shot this. I would later pace the train with my bike as he headed up to Stinson Ave. Description: East Bound and down at the MSU CN Crossing. Description: CN 435 is backing onto its train with a lift of autoracks from Aldershot yard. 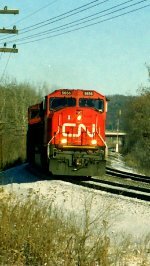 CN 2694 - CN 5279 - CN 5656 departed for the Dundas Sub soon after with 123 cars. Description: Molten sulphur tank train for Occidental, FL passes Edgewood on the mainline yard bypass with power once common on CSXT's sulphur trains to the Bone Valley.